Stone Bank’s Mystery History Revealed! A big fat question mark! That is mostly what we knew about the Stone Bank — originally the Bottineau County Bank. Land records didn’t reveal much and details of exactly when the Stone Bank was built have been, well, sketchy. But now we know. And this is HUGE. 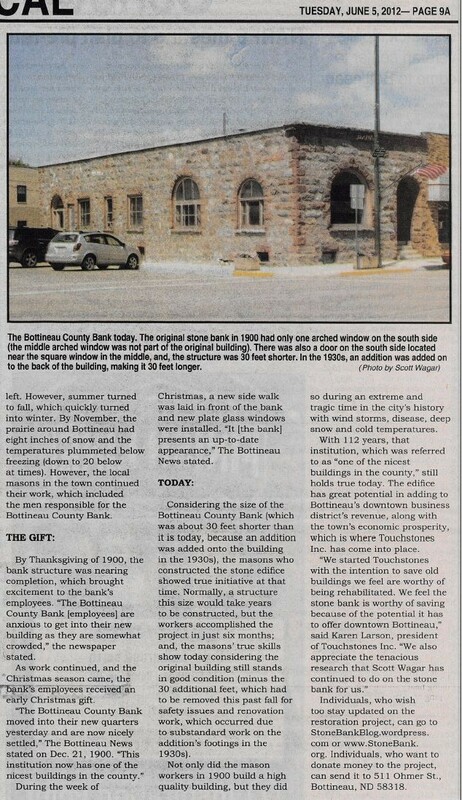 Scott Wagar, the intrepid editor/reporter for the Bottineau Courant has been digging in the local archives for a year and at long last uncovered what we didn’t know before — who built the bank, how long it took, and when it opened. Whoo-hooooooooooooo! Scott is a history buff and he did this on his own time — even though he has more than a full-time job. We can’t thank Scott enough, because he really did the Stone Bank family a huge and everlasting favor. Bravo, Scott. 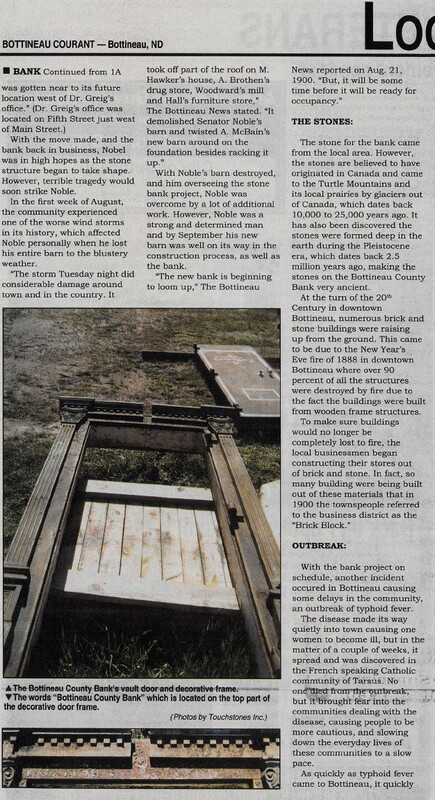 The story, which ran in the June 5, Bottineau Courant is posted below (with Scott’s permission). What a marvelous and interesting story. Leave a “like” for Scott, because he deserves a boatload of them. Let’s face it — Scott is simply STONE-TASTIC! Please, leave a “like” for Scott, because he deserves a boatload of them, and thanks for reading the Stone Bank Blog! It would tell us that it should stand for another 100 years. But it can’t speak for itself, so the McLean County Heritage Preservation Foundation wants to set the record straight. 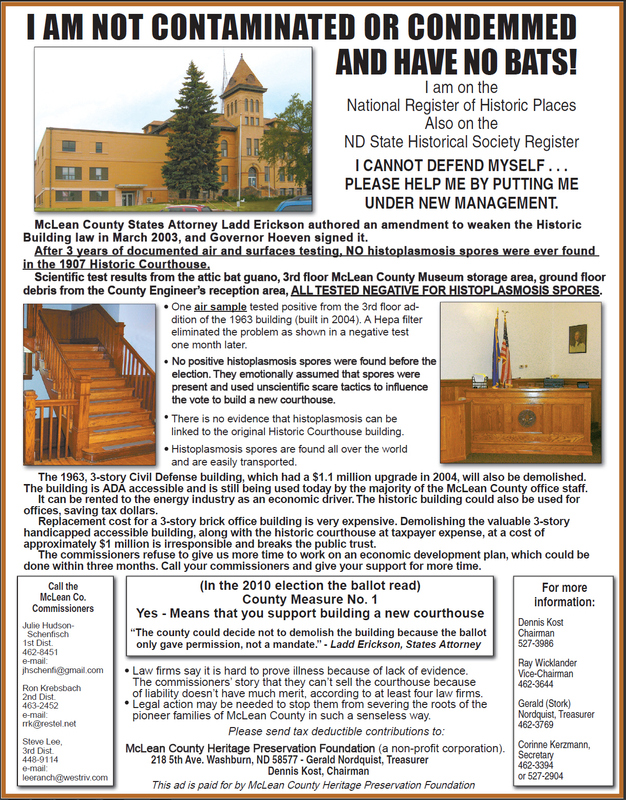 Last week, the nonprofit group created and placed an ad in the local paper to dispel a persistent misconception about the endangered 1907 courthouse. A misconception that is further endangering the old courthouse. McLean County Historic Preservation ad about the 1907 courthouse which has been slated for demolition by the McLean County Commissioners. In an email, Betty Kost, who is a member of the McLean heritage group, told the Stone Bank Blog that there is confusion about the difference between bat guano and histoplasmosis spores — and that the local news reports have said the building is contaminated, when the scientific tests show that it is not. Betty notes that histoplasmosis spores can be found anywhere — in chicken coops, barns or other places where that birds roost — and can be carried on birds’ wings, beaks and feet. Hunters, landscapers, farmers etc. can transport the spores on their clothing or shoes, too. But bats can get it in their systems and spread it in their guano. This does not mean that the spores found in the courthouse were brought by bats. The courthouse serves many hunters, landscapers, and farmers, so it easily could have come from a different source. The point, the preservation group says, is that the courthouse is NOT contaminated. Period. Wouldn’t it be a shame to see this lovely, historic building demolished for no good reason. It’s not a threat or a danger, so why not give this group time to create a plan for reusing it? So, if you can, why not send the McLean County Historic Preservation group your encouragement, your ideas and even some cash? They have a big fight on their hands to save this building. (Contact info. is in their ad.) And you can contact the county commissioners at the addresses listed in the ad, too. And give a “like” to this post! It’s always good to know the message is getting out! The Stone Bank project now has a Stone Bank blog! We will post updates here as work to restore and find an adaptive reuse for the Stone Bank building moves forward. Join us as we uncover this historic landmark’s past and create a new role for it on Bottineau’s Main Street.